GFCI stands for ground fault circuit interrupter. It’s the kind of outlet that’s installed in areas that see water—like your bathroom, outdoor areas, laundry room, and/or garage. They’re meant to protect household occupants from serious injury due to electric shock, and will automatically shut off if moisture is detected, or if your electrical system is overloaded. When more amperage passes through an electrical circuit or wire than that component is designed to manage, overloading can happen. Basically, when you try to draw power for too many lights or appliances from a single outlet, this is what happens. Even if you’re using different outlets though, you still need to consider the overall capacity of your home’s electrical system. Your electrical wiring and circuit panel both need to be able to handle the total load of all electrical appliances, equipment, and lighting that depend on it. Sporadic dimming of your lights or flickering. The sound of crackling, sizzling, or buzzing with no known source. Sparks flying when an outlet is used. Discolored wall plates or electric cords. Multiple electrical appliances in your home malfunctioning or breaking down. If you notice any of these signs, the best thing you can do for your home and safety is to cease use of the applicable outlet, appliance, or wall switch and call for an electrical inspection right away! No, not at all! 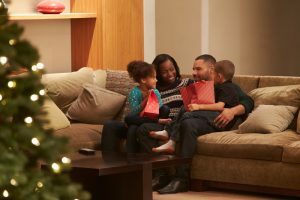 You can prevent electrical overloads without sacrificing your enjoyment of the holiday season. To do this, we advise that before you put your lights up, call our professional electricians to inspect your system. We know what to look for and can spot hidden hazards like faulty or aging wiring. We’ll make proper recommendations from there, such as potentially upgrading your wiring or your electrical panel if needed. An additional benefit of upgrading your electrical panel for your holiday lighting is that if you’re in the market for any additional appliances or home automation upgrades next year, you’ll be fully equipped to take on the increased electrical demands! Do let our team know if you plan on any electrical additions should you be interested in a panel upgrade.